The Raid will be based at the Mylor Yacht Harbour, situated in the Carrick Roads near to Falmouth in Cornwall. The Roads offer some of the best sheltered sailing water anywhere, so the location should be perfect for a Raid. 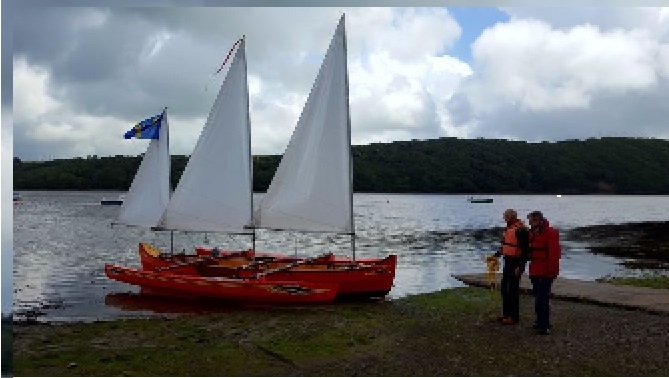 The boats will be launched, moored and recovered at Mylor Yacht Harbour (MYH). The location allows us to offer a little of everything for everyone within the sail and oar community. We have the possibility of going out to sea and/or pottering up some lovely creeks. Even if the weather gods try and spoil things , we believe we will almost always manage to put on some sailing. For those of you who haven’t been to this part of the world it will provide a good taster to the area, and for those who have visited before we think you will agree its a great place to sail. The exact programme needs to remain as flexible as possible and will depend on tidal and weather conditions. Thus, apart from Monday and Thursday evening/Friday am, everything is fluid. Row/sail to the Pandora Inn, Restronguet Creek. Cream Tea and/or a pint, row/sail back to Mylor Yacht Harbour. We have arranged for the use of a camp site(Tregunwith Farm) for those wishing to camp or caravan. It is just the other side of Mylor Bridge Village, about two miles away from MYH. For those who are camping, we will be providing a hearty breakfast every morning at the harbour, this will be followed by the daily briefing. There is also accommodation available, either in the form of self catering flats at MYH, or some small cottages at the camp site. There are also many B&Bs and holiday cottages in the vicinity. Hotels are based in in Falmouth which is only five miles away. We will be eating breakfast and supper in Castaways Bistro, at the Yacht Harbour. Packed lunches will be provided on the Tuesday, Wednesday and Thursday. The cost of the raid is £220 per person (this includes 3 packed lunches, 4 dinners, mooring fees and car and trailer parking). We have assumed that non-camping Raiders will have their breakfast in their own accommodation. There is no charge for children under 5 and children 5 – 12 will be 50% of the adult cost. To book your place on the Raid please go to register , complete the form and send it to us. A booking deposit of £50 will secure your place. 402410 61420933 and Raid England are the details you will need if making a BACS transfer. If you are making an overseas transfer you will need to know that HSBC is the bank, Market Place, Henley-on-Thames, UK is the address together with some or all of the below. Please can you “pay” the transfer fees as well because UK banks charge us a lot for accepting money from outside the UK ( although I believe it is free for you if within the EC) or contact me first to discuss the best way of paying.